Give your children a gift that will last a lifetime. Give them a love for reading. These six steps will start your children on the road to a lifetime of learning and reading. Read to children as often as possible. If you expose them to reading early and often, it will become a pleasurable experience they will want to repeat when they read on their own. Picture books can help struggling readers to comprehend a story before they can read all the words. Let them enjoy the process, without getting bogged down with the exact words. Let children ‘pretend to read’ using the pictures for guidance. 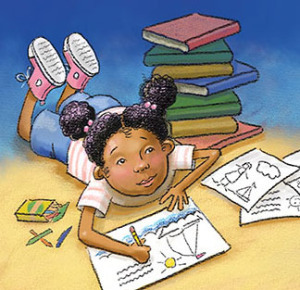 Encourage young children to write and illustrate their own stories. Children have great ideas, make sure they are able to express these ideas freely. Previous Do You Run Contests or Giveaways on Your Blog? Are You Sure They’re Legal? Next Calling All Children’s Books Authors – Special Needs Children Need Your Books! Absolutely, Bette. I raised my children to be readers and have done my part encouraging my grandchildren to be readers. Reading with a child is a winning cause.